Duck, Chinese sausage and sriracha turned out to be a pretty good combination - the duck meat slow-roasted and tender, the coins of thinly-sliced sausage generously scattered throughout. The sriracha butter was way too timid, though, particularly when mixed up with all those noodles. I was expecting more heat here: anything with "sriracha" in the name should not be timid. I made a return visit the following evening, and tried a bowl with "bacon sauce," garlicky pork meatballs and mixed vegetables. The bacon sauce brought a buttery emulsion flecked throughout with a dice of bacon, cooked soft rather than crisp. The pork meatballs were a nice textural balance between springy and firm, with a strong whiff of garlic; the mixed veg brought a nice complement of mostly shredded carrots and some leafy dark greens. All good, but I once again found myself longing for a little more oomph. Both times, if I tasted the broth on its own, it was great - but with noodles, the flavors seemed more diluted. But it's not all noodles at American Noodle Bar. There are a few sandwiches, including a banh mi which used as good a baguette as I've had anywhere in Miami: light, with a crust that was crisp without being overly crusty. It was filled with "deli meat" (is there a more accurate name for that baloney-like mystery meat that is standard issue for banh mi?) and paté, pickled carrots and cucumbers, cilantro, mayo, and sriracha. Some of the pork meatballs would have made a worthy addition. I also tried, because I couldn't help myself, the "fried cheeseburger dumplings," which tread dangerously close to something you might find at TGI McFunsters, but manage to stay just on the right side of the line. I won't lie: I liked them. Quite a bit. A green curry mayo makes a nice accompaniment, but possibly even better was a simple salad of julienned cucumber and tomato, lightly soaked in a dressing redolent with fish sauce, that came alongside too. Just about as good were the light, crisp edamame hushpuppies, which came with the same green curry mayo and a kimchee ketchup for dipping. There's a nice selection of craft beers for about $5-7 a bottle, as well as the ubiquitous hipster accessory, Pabst Blue Ribbon, at $3, plus a small selection of wines and sakes. American Noodle Bar is certainly not the only casual, Asian-influenced restaurant to open up of late in Miami. Maybe if it had managed to open in January 2010 it could have laid claim to "first," but in the meantime, Sakaya Kitchen, Chow Down Grill, Gigi and still others beat it to the punch. And it undoubtedly shares some similarities, including Sakaya's fast-food style counter service and chalkboard menu. But there's enough to distinguish each of these places from one another that I could happily round out a week of eating visiting each of them. From my first experiences at American Noodle Bar, I find myself thinking the same thing I said after my first meal at Sakaya Kitchen: "Fortune favors the bold." This is not the place for subtlety. I enjoyed the flavors of everything I tried, but I did often wish that I could find a volume dial so I could turn up those flavors even more. I also think that a few "composed" noodle bowls with some items pre-selected by the chef would be a great idea. 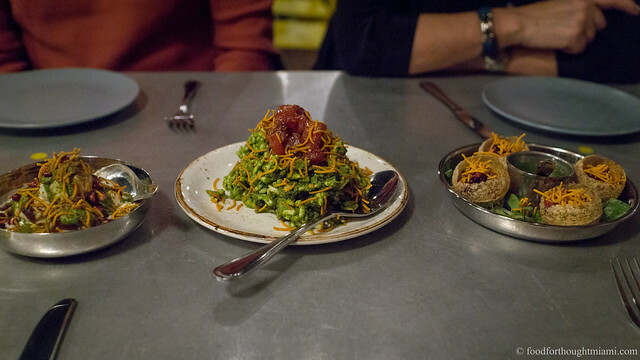 It's a nicely assembled menu, it's a funky space, it's a great addition to the neighborhood, and a good change of pace, even from the other casual Asian places that have cropped up the past year or so. Chef Bloise has a lot of talent, and I'm sure with a little time he'll find the right spot on the dial for these flavors. [*]Back in July, the opening date was "some time next month." Only a few months off. Ah, the joys of attempting to open a business in Miami. I see fried cheeseburger dumplings in my future. Overall agree with your assessment. Flavors were muted for everything I tried and I hope they get turned up. The cheeseburger dumplings and pork meatballs were the highpoints for me. I like the overall format and concept but need to go back and search around for a more satisfying sauce+topping combo. Welcome to our hood Noodle Bar! It's been packed every time I've been driving by on the way home from work. The noodles are definitely worth trying - I really like the menu format and have only begun to scratch the surface of the various sauce & "add-on" pairings. I enjoyed the noodles I had on Friday. I chose a similar combination to the one you did: sriracha butter with smoked duck. We also tried the scallion hush puppies (guess they were out of edamame). The mayo and ketchup were good accompaniments. I liked the concept and will go back to try more flavor combinations. Went back and tried the "you know you want to try it but it's a little over the top" bacon sauce with vegetables and duck. Definitely more flavorful than the sriracha sauce, but the vegetables were definitely lacking. The bowl can look a little bland before even taking a bite (white bowl, off-white noodles, pale yellow sauce). I think they should throw in a few pieces of green leafy vegetables or carrots or something to make it a bit more appealing. One big up though is the egg roll. It's one of the best I've had. Reminds me of ones I had growing up, but good. Looking forward to many meals here (and agree with Jackie, ramen would be great!). Overall I agree with your assessment; flavor was really lacking. My girlfriend and I shared a noodle bowl (lemongrass, meatballs, shrimp, and "veggies"). There were no veggies, the shrimp were very small and the sauce was boring. I am thinking it was a bad combo since I couldn't get my girl to try the bacon sauce or sriacha butter. I think I need to go back. We also tried to bahn mi which had a delicious, crusty bread, but the pate used was cut from a pre-made roll and was really lacking overall. Kind of a disappointment after all the hype. I hope I can get myself to return. Oh, one more thing, there were no "veggies" in my "veggie" add on, albeit six slivers of carrot and I think I saw a leaf of bok choy. I really enjoyed your blog, I am a chef myself & I do Italian Catering in Miami. I wanted to like it, I really did. And I was so excite for good food. Alas, the noodles tasted like spaghetti and my chicken wings were fatty and gross. Who messes up chicken wings. The cheeseburger dumplings that my got were not tasty. The only positive thing I can say about the menu was the delicious homemade ginger soda. They should stick to that. Somehow I don't think having a restaurant that specializes in homemade ginger soda is gong to be a ticket to success. 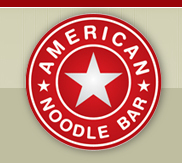 With repeat visits, my experience has been the exact opposite: I've found that American Noodle Bar has really stepped up their game, and I'm picking up from there about once a week. They've turned the flavors up a notch on the sauces, and I've started to better navigate the toppings. I particularly like the slow-cooked duck, the oxtails when they have them, and the tofu, which is marinated and possibly smoked, was excellent. The banh mi is a winner, and the pulled pork sandwich with a creamy avocado spread is really good too. Plus there have been some good daily specials: crispy pig head cake over a nice salad with asian pear, pork belly over a melon salad. I'm thinking I need to update this post.